Today’s challenge is held in Sydney and the contestants are on boat. They arrive at Cockatoo Island and are greeted by the judges. Pete tells the contestants that Paige and Rosie are not competing today as Paige has an injury. 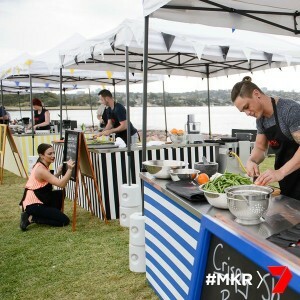 Today’s challenge is at Cockatoo Island to celebrate the ocean, showcasing the best of Aussie seafood. Tonight they are cooking for the fishermen. The two lowest scoring teams will be going into sudden death where one team will be eliminated. The teams only have 1 hour to cook. Time begins and the teams rush off to claim their seafood. Mitch and Laura are cooking a snapper remoulade. Eve and Jason are cooking pan fried ocean trout with tempura cauliflower chips. Gianni and Zana are cooking salt and pepper squid. JP and Nelly are cooking herb crusted tuna. Lauren and Carmine are cooking crispy skin salmon. Alex and Gareth are cooking crispy skin barramundi. Chris and Cookie are making tempura prawns. Tasia and Grasia are making spicy mussels with lemon grass and lime. Mike and Tarq are making Singapore chilli grab. Zana is a little rattled by the seagulls hanging around as she says they are full of diseases. Lauren is having a mental blank about spelling asparagus and then she notices that the boys Alex and Gareth are also cooking a crispy skin dish. Colin walks along to Alex and Gareth’s bench and asks how they are going to get crispy skin. They say they are cooking it in the oven and he questions if it should be cooked in a pan to make it crispy. The boys decide to stick with their original plan and put the fish into the oven but suddenly realise that the oven is cold. They decide they have no choice now but to cook them in the pan as Colin had suggested. Lauren and Carmine are carefully pin boning their salmon fillets. JP and Nelly have crumbed their tuna fillets and Nelly asks JP to turn on the pans. Colin turns up at Lauren and Carmine’s bench and tells them they’re running behind and the elements they are working on are not relevant and to work on the salmon first. Eve and Jason are pan frying their trout and mike and Tarq are cooking their crabs. Tasia and Gracia are stressing as they are cooking their sauce. Gracia is worried that it is too spicy. JP and Nelly are searing their tuna but are finding that it is overcooking very quickly. Lauren and Carmine’s salmon is sticking and Alex and Gareth’s fish is burning. JP and Nelly cook a second batch of tuna and it cooks perfectly. The fisherman and their families arrive on boats. Time is running out. The teams start plating up their food. People start queuing up for the food and the time is up. It’s time to serve the guests. Pete and Colin taste the dishes. First they taste Chris and Cookies tempura prawns. They like the light and crispy batter. Next up is Gianni and Zana’s salt and pepper squid. Colin likes the texture and Pete says the squid is cooked well and it’s a really good dish. Next is Eve and Jason’s trout. Pete thinks the cauliflower chips are delicious and he loves the lemon aioli. The fish is cooked perfectly. Next up is Mitch and Laura’s dish. Colin likes the fresh fennel and the mayonnaise. Alex and Gareth are stressed as the guests keep sending back raw fish. The dish the judges taste next is Alex and Gareth’s barramundi. Pete says his fish is cooked perfectly but his skin is a little burnt. The next dish they taste is Tasia and Gracia’s spicy mussels. Pete and Colin love it, Pete would have loved some more sauce. Mike and Tarq’s chilli crabs. Pete says it is cooked to perfection, he says the dish is a knockout. Carmen and Lauren’s crispy skin salmon. Pete says the fish is cooked perfectly. JP and Nelly’s tuna dish. Pete says the tuna is seared well but there’s nothing to tie the dish altogether. Colin says there is a lot of salad in the dish. There’s only 30 seconds to go. Gianni and Zana have sold out. Time is up! Now it’s time for the guests to vote on their favourite dish. Colin said Chris and Cookie’s prawns were his dish of the day. Pete said Zana and Gianni’s dish was beautiful. Pete said Eve and Jason’s trout melted in your mouth, Colin said their mayonnaise was spot on. Pete said Mike and Tarq’s crab dish was brilliant, the sauce was delicious and the crab was cooked to perfection. JP and Nelly, Colin said the tuna was seared perfectly but the dish overall was just an OK dish. Pete and Colin said Carmine and Lauren’s salmon was cooked well. Pete said Mitch and Laura’s snapper was cooked perfectly and the dish was a revelation. Colin said Alex and Gareth’s barramundi dish was cooked perfectly the rest of the dish was not great. He mentioned that some of the diners received raw fish. Pete says Tasia and Gracia’s mussels in sauce was the best sauce he had today and the mussels were cooked to perfection but the rice was very average. The people’s choice dish belongs to Carmine and Lauren, they are now safe from the next two eliminations. The two weakest teams as chosen by the judges are Alex and Gareth and JP and Nelly. They now need to cook of in a sudden death round. Both teams are disappointed to be cooking against each other as they are good friends.